You may also notice that some important milestones have been moved from this Topic to their own (e.g. Frankston's Think Big, the first tree planting event and the Group's public documents). Now is *really* your opportunity to get involved. The Group changed its name to Down’s Estate Community Project Inc. on 1 October 2016. 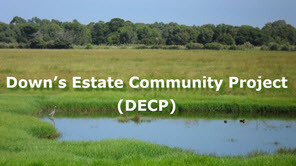 The Down's Estate Community Working Group was formed on 28th January, 2014 and is comprised of Community Group representatives, collaborating to develop a visionary proposal for the land previously owned by Harry Down. We are concerned about its future. "... parcel of land occupying 20.8 ha, ‘Down's Estate’, which adjoins the north-eastern corner of Seaford Swamp. This parcel of land is currently situated outside the Ramsar boundary." The SCC is seeking residents' views on this and other issues so that we can truly represent the residents and take your input to FCC on your behalf. We have asked FCC when the Down's Estate Master Plan will be available for comment - watch this space. 1. Urban Agriculture - responds to interest in the community over food security, previous agricultural use of the site (although only ever was grazing), existing infrastructure present. Includes use of the shed for storage of machinery etc and house for office admin, area adjacent to the buildings for a nursery, intensive cropping area and orchard, area at the northern end (considered most appropriate due to flooding, results from soil testing and proximity to the RAMSAR listed Seaford Wetlands) for crop production. 2. Wildlife Shelter - responds to the request from the community for a location for a 24 hour native wildlife facility (thee is not one within Victoria). Include use of house for office admin, shed to be converted to animal hospital, area adjacent to buildings for animal enclosures. 3. Community use - Responds to the lack of nearby community facilities. Includes use of house for community activity (e.g. meetings of friends groups and community groups), shed for interpretive and educational space (ecological, historical, cultural), outdoor gathering space adjacent to buildings. 4. Picnic Place - responds to Council's current financial position (minimal upgrades and ongoing maintenance). Include removal of buildings and provides for an informal play space, picnic area, walking paths etc. 6. Ecotourism - the Down's site as a integrated piece of the wetlands site. The site offers ecotourism opportunities - draw people to Seaford; come by train, cycle around the wetlands, maybe have a picnic, perhaps a cafe at the Down's site, recreation - bird watching, join in farm activity, canoe on the ponds, etc. Across Wells Rd are other recreational venues - motorbike scramble track, BMX bike track, model plane flying club. 7. Fire reduction - the northern end of the wetlands carries a large proportion of grass and can be a serious fire hazard in the summer. Kangaroos and wallabies would have once grazed there, that historic pattern could be mimicked by a pulse grazing approach with goats or cattle. This would lead to a substantial reduction of the fire hazard. which may justify the cost. This would probably entail negotiation with Patterson River Secondary College to acquire some of their land. The many traffic calming measures introduced in Austin Rd, Mitchell St and Old Wells Road show that the current access route is inappropriate and inadequate. 9. It is believed that Seaford North Primary School also has some land abutting the Seaford Wetlands which has native vegetation. Perhaps this could be integrated? This issue is expected to be debated at the Council meeting on 18th November. Not to use the Down's for purposes that would compromise the wetlands, to not allow housing alongside as has been allowed around 50% of the Ramsar site. Ideas include a vegetable garden supplying vegetables to local residents, a plant nursery, a commercial kitchen and cafe, a tree crops orchard and food forest, a cattle herd, even goats and a dairy. This would be a productive farm where people could participate, as workers, as learners as shoppers. Another whole-of-site issue. The wetlands offers the opportunity for educational experience for local schools, and schools further afield. These could be outdoors activities, hands-on and practical activities providing training in the field, different from what is offered at the Edithvale Wetlands Centre, The Curriculum resource - 'The Oasis Next Door' written specifically for the Edithvale-Seaford Wetlands is ready to be used and other curriculum are available, in nature studies, natural resources management, outdoor education, geography, etc. Facilities developed on the Down's site could contribute to this educational offering, the northern section from the schools on the west to the Down's site could be an educational precinct. The two schools - Seaford North Primary and Patterson River Secondary already offer curriculum engagement, PRSC has 4 subjects in their 2014 yr 9 curriculum working in the wetland and the SNPS bush. These schools could mentor and support other schools. A potential member of the SCC attended the Council meeting on 18th November to broaden their views and to expand on the (only) 2 options being put forward for their consideration. We are encouraged to learn that Councillors will indeed broaden the definition of “amalgamated” to incorporate more than the narrow definition outlined in the reports. We'll post more information about the consultation process when it's available. It is now up to residents to clearly define and broaden (if necessary) the "amalgamated" option. Following extensive planning and development, Council is inviting members of the public to submit their feedback on 2 options in the Down's Estate Master Plan. These options set possible directions for the future use and development of Down's Estate, 20.8 hectares Council-owned land in the North-eastern corner of the International Significant RAMSAR listed Seaford Wetlands. The Master Plan aims to provide a guiding vision for this site and make recommendations for the appropriate future use and development of the land, ensuring that any uses and activities are suitable for the site and compliment the conservation values of the immediate and surrounding area. This is particularly important given the ecological values present within the adjacent lands. During the development of the Master Plan, 5 options were proposed. Two of these options have been approved by Council for further consultation. The 2 options that are being considered by Council for public comment are the Picnic Place and Amalgamated use. Some useful discussions were had over the last couple of Saturdays. Environment and Community Development departments are working together to organise an effective consultation process on the two options. A special meeting is being organised for the relevant community groups, Ward Councillors and Council staff to discuss the Amalgamated Use option. The relevant community groups should be receiving correspondence shortly from Council asking about their availability for a meeting date in mid or late January. As consultation on the Amalgamated Use Option involves hearing the views of a number of groups in an impartial and equitable way, Council will be using the services of a professional facilitator to run the meeting. As the site is currently not open to the public [except use of the Shared User Path], Council staff are investigating the possibility of scheduling some Guided Walk & Talk sessions for interested members of the community. A facilitated workshop was recently organised by FCC for 14 or so representatives of local community groups keen to assist Council with deciding the best outcome for the Down's Estate. If your group wasn't invited but would like to be involved, contact either us or FCC's Environment Dept. a straw poll was taken of attendees as to their preferred option and not surprisingly (given the attendees) went strongly toward the Amalgamated Option, with only 1 person wanting the "Picnic Place"
Much of the night was taken up with small group discussion of around 4 groups of 4, with a FCC staff member taking notes. - "He was a lovely man who wanted to bequeath his land to the local aboriginal community"
Since it is believed that Council Officers will prepare a recommendation for the Council meeting in March 2014 without further community input, a working party of community groups - independent of the council officers - has been formed in the hope of making the best use of, and respecting the land and Harry Down's memory. This proposal may take the form of a phased approach, where a small financial outlay is allocated by Council each year until the project is completed. There is room for further discussion on the issues of urban agriculture and environmental education for Frankston. It is believed that many Councillors will need to be lobbied to approve the "Amalgamated Option" over the "Picnic Place" option. Hey, it needn’t cost a lot of dollars – do the right thing! Following the FCC-facilitated workshop mentioned above, the Down's Estate Community Working Group was formed. It is comprised of Community Groups, collaborating to develop a visionary proposal for the land previously owned by Harry Down. If you'd like to join or express support, please email the SCC or downsestate@gmail.com. The Down's Estate Community Working Group has met several times over recent weeks, one of which took place at the site. FCC Environment Dept very kindly arranged a tour of the site for us. (Unfortunately) this only gave us more ideas - LOL - no, that's a good thing. Received great news today. FCC - Councillors and others - are to be congratulated for their decision to remove the Down's Estate from their March Agenda, giving us time to prepare our vision for them to consider. In our proposal to Council, we hope to include not only various exciting options, but funding models and a list of other Community Groups eager to come onboard and work - together - toward a fantastic outcome. The growing collaboration (and indeed friendship) of members of different community groups - that started with diametrically-opposed views - is exciting to watch and be a part of. Please refer to the attached flyer containing details of a public meeting. We hope you can attend. Representatives of the 6 Community Groups involved will be on hand to answer your questions. Feel free to send the flyer as far and wide as is appropriate. The Working Group’s Submission (4 documents) has been sent to FCC. All of our current documents are now on Google Drive and are public documents, so you should have no trouble accessing them. Let me know if you can’t access them and I’ll email them to you. Just click on the link below, then view and/or download. Now to win the votes of our Councillors. Feel free to share this information as far and wide as is appropriate. Highlight to your network members the “Down's Estate WG - Register of Support”. We expect the Council will make a decision at their meeting on 18th August, but this will be confirmed. Here is a caricature map (a cartoon) of some of the possibilities that could be envisaged for the site. NOTE that nothing has been ruled in or out at this stage. This is not a detailed plan (as some have thought). It is a "caricature map" - merely a pictorial representation of the types of categories of what could be. It's just a "pretty picture to catch the eye" and provoke thought. It depicts community activities (that are yet to be defined) on the Eastern side of the bike track and restoration to Wetlands on the Western side (details of which are also yet to be defined). The team is currently contacting Councillors to try to arrange personal meetings to discuss our plans, answer questions and allay any concerns. On behalf of the Down's Estate Community Working Group, a group of volunteer community representatives who have been working together since January 21 this year, we are proud to present our submission (attached) for the Council's consideration. Our submission includes a written and pictorial set of ideas that demonstrate how we envision the existing Down's Farm can become an exciting asset to the community within the next 6 years. Also included is a draft business plan and budget that begins to detail how our plans can be successfully implemented. Our submission is financially prudent. We foresee a Management Group consisting of all the major interested parties as the entity to bring these plans to fruition in partnership with the community. We have had extraordinary participation in the development of this document. All the schools in the area are ready to participate in our planned activities, and the Patterson River Secondary College Deputy Principal stands ready to incorporate his VET and VCAL programs into our plans. We have described what we would like to achieve with a Melbourne Water representative, and have found no areas that cause them concern. They await the Council's decision, as do we. Between now and the date this submission comes to the Council, we will be meeting with Council members and Staff to answer any questions and hopefully, develop more exciting ideas. We have been encouraged by the positive response so far, but there is still a way to go yet. No date for a Council decision has yet been set – will advise when known. We hope to have more news soon. Update on the Community Working Group's proposal for the Down's Estate in Old Wells Road, Seaford. With the support of Cr Glenn Aitken and key Council Officers, this project is gaining momentum! As one indication of their commitment, a hole in the shed was repaired within two days of its notification. There have been three joint site meetings so far: the first two to look at the grounds around the buildings and the third to view the interior condition of the house and large shed. We have also had a further 2 planning meetings, with more planned. Whilst there is a large amount of graffiti and some minor vandalism, the structures seem sound and fully viable for restoration and community activities. We are currently discussing with FCC the organising of joint working bees to clean up the site and make it safe as soon as possible. It is hoped that this activity will deter further graffiti and vandalism. If you and/or your Group would like to get involved with this exciting project or require more information, contact us via the email below. - The Down’s Project is always discussed at the Seaford Community Committee’s stall at the Seaford Farmers’ Market and always receives very positive feedback. We had a very productive meeting with Council officers and Councillor Glenn Aitken on 15th May. We discussed the logistical requirements to commence some work on the site complying with OHS work plan and volunteer manual requirements. One of the first aims of cleaning up around the buildings on the site will be to deter current vandalism. Once we have complied with the planning requirements, activities such as rubbish removal, manual weed control, removal of soil and some vegetation around the buildings can commence. We are working on a plan in this joint working group, defining the final outcomes sought and breaking it down into the steps required to achieve this outcome. The key stages could be achieved over successive years in order to reduce the overall cost to all contributing stakeholders. Appropriately-qualified volunteer labour as well as general community volunteers would also be sought to support this project. Another meeting will be held in June to further progress this stage of the project. Unfortunately the large shed and farm house were again broken into which the Council will again secure. This underlines the need for action to begin at Down's Estate as soon as possible so that this can become a useful and valued community resource. The Down's Estate Community Working Group (DECWG) had a productive meeting and site inspection on June 29th with 2 Council Officers with the aim of sorting out safety and logistical issues to enable a clean up on site to commence with volunteers. We are feeling positive about these steps forward. Mayor Sandra Mayer responded to a recent newspaper article (see below) quoting local residents’ concerns about the site by saying that Council is working with the DECWG to address this matter. Unfortunately, there has been yet another break in to the barn that is again being secured by Council. At a recent meeting with Council Officers, we were advised that the Frankston City Council (FCC) public meeting for a decision to be made on the future of the Estate of Harry Down is expected to be Monday, 16th November, 2015 (starting at 7 pm). Please add this date to your Calendar – as you know (or would expect), the more people who attend in support of an issue, the better. A few days before the meeting, we'll post here if it will not be on that Agenda. ALL buildings being demolished, including the house and barn, with no plans for other buildings. Council Officers were asked if capital expenditure listed in the report would include not only the cost of renovation or demolition of the house and barn, but also the cost of development of other required buildings. The response seemed to indicate that further building development costs would not be a highlight (if they were included at all), but may have to wait for “a couple of years” to be discussed during the development of a new joint master plan. We pointed out that many Councillors could opt for the “little or no expenditure at this point in time” option and the buildings would be lost. We believe that the loss of these buildings is very significant on historic and practical grounds: including the need for shelter, storage and display space for community use. - your attendance at the Council meeting. The Down's Estate Community Working Group (DECWG) has had numerous meetings with Council Officers and FCC Councillors both on and off site, including a formal presentation to Councillors. All of these encounters were positive and included the renovation of the house and barn. Frankston Councillors received a Briefing from Council Officers on 12th October 2015. We were told that this Briefing outlined a number of options based on the DECWG Submission of June, 2014 and items from the original FCC Master Plan of 2013 (“Picnic Spot” and “Amalgamated Use). It was at this Briefing that a second report, listing a set of options based on ALL buildings being demolished, was requested. The Downs Estate Master Plan (should be Down’s), dated January 2013 was an attachment to the Agenda for (and Minutes of) the Frankston Council (FCC) Public Meeting #247, held on 18 November 2013. Download the FCC documents by clicking on the links and then refer to the pages listed. Members of ​​​the Down's Estate Community Working Group will be at the Seaford Farmers' Market on Sunday, 15th November if you'd like to meet to discuss the issue. We support the Council’s own Building Surveyor's report, which indicates that both the house and shed are essentially structurally sound. As you know (or would expect), the more people who attend in support of an issue, the better. At the Frankston Council meeting on 16th November 2015, Councillors decided to defer their decision on the Officers Report on the Down’s Estate! This means that the current buildings are safe – for now. The next steps are now being planned. Our members provided the right arguments and Cr Glenn Aitken read out a letter from Carrum MP, Sonya Kilkenny, suggesting the possibility of State funding. It seemed to go a long way towards their decision. A petition supporting Down's Estate buildings was tabled with the 60 signatures collected at the 15th November Seaford Farmers Market. After the unanimous decision was made, most of the public gallery then left. THANK YOU to those who attended to lend their support. A constructive meeting was organized this week by Sonya Kilkenny (State MP for Carrum) with FCC Councillors, Officers and members of the Down's Estate Community Working Group (DECWG). Further talks are now being scheduled for early in the New Year to develop a Report for Councillors which will be designed to move the Project forward positively with due consideration to community participation and desires. We now look forward to a collaborative future. Both documents are attached below. Although Stage 1 has a proposed budget of $10,000 (suggested to improve asset protection onsite) it could be undertaken with no asset protection and NO cost to Council other than some meeting time for Council Officers. We greatly appreciate your interest and support in this Seaford project, at the heart of which is care for the environment and community connection. This could be our last opportunity to keep the Community Amalgamated Use option alive. Monday, 22nd February, 2016 (at 7 pm - it's good to be a little early.) A few days before the meeting, we'll post here if it is not on that Agenda. FCC Officers are revising their November 16, 2015 report to Council - and its recommendations. It is hoped that Councillors will be asked to vote in favour of the $10,000 Feasibility Phase outlined in Stage 1. Note that we will not know the actual recommendation/s to Councillors until after the Meeting Agenda is posted online a few days before the meeting. DECWG has been working (very) consistently on this project for over two years (and other community groups from 2011). Our proposal is to see the site used by a variety of community groups for education, training and engagement on environmental and sustainability issues and for many other community development purposes. We envisage a family-friendly project in keeping with the Wetlands environment and the other community facilities along Old Wells Road. More background is in the above posts. The recommendation is (again) to demolish the buildings. We would very much prefer they remain for meetings, displays, education, storage and other approved uses. If they were to be demolished, there is no guarantee that ANY buildings would EVER take their place - there certainly isn't ANY money in their budget. Even the 13 items in the list for the house are relatively minor. We owe a big Thank You to FCC and everyone who has participated in and supported this Project ........ now the real work can finally start. Here is the terrific news from the 22nd February FCC meeting ...... a special Thank You to those who attended. A compromise between protecting (while evaluating) the main buildings and removing the lesser structures (to increase public safety and reduce risk) saw an alternate Motion passed unanimously. We have our first meeting next week and will keep you apprised of progress. Council has responded to the interest from some community members committed to restoring the Down's Estate historical farmstead in Seaford. At the February 22 Council meeting, Councillors agreed to work with the Down's Estate Community Working Group (DECWG) to allow them to set up a Steering Committee and provide Council with a Master Plan for the future of the site. Over recent years, the site has fallen into disrepair and has been struck several times by vandals. “While Council undertook an assessment of the property structures to determine which of them were structurally unsafe,” said the Mayor. Down's Estate, which adjoins the RAMSAR-listed Seaford Wetlands, was once the homestead of renowned saddler and whip-maker Harry Down, and represents a significant historical connection for the community. “There is also a rich indigenous history connected to the site which should be recognised,” said the Mayor. In 2007, Council purchased the property, in an agreement with other Victorian Government agencies, to ensure the ongoing protection of the wildlife surrounding the Seaford Wetlands. “DELWP and Melbourne Water also purchased surrounding properties, in a bid to protect the natural environment and heritage of the area,” said the Mayor. According to the Mayor, the community interest in Down's Estate has sparked a number of conversations around the site’s potential. The newly formed DECWG Steering Committee will present a revised Master Plan to Council in June 2016. Since our meeting with FCC on February 29 to establish the Steering Committee for the 3-month feasibility study, we have met 3 more times. The committee comprises 3 Officers from the FCC Biodiversity Department, representatives from Melbourne Water and Westernport Biosphere, 3 representatives from our Down’s Estate Community Working Group (DECWG) plus invited guests who can contribute to the topics being covered at a particular meeting. So far we have covered agreement on different zones at Down’s Estate to establish their ecological profiles, requirements and principles which should apply to them and their usage, the projected use of the buildings on site as well as the kind of governance structure that would be most appropriate for community involvement. It has been a very productive process to date with all parties working hard to establish the most appropriate and viable usage of this site which meets the needs and aspirations of the community (via DECWG) and also addresses key management objectives of Council. We have established some subgroups to consider specific interest areas including the Indigenous and white settler history of the site, the growing of food onsite using permaculture principles and the establishment of a spiritual or contemplation space, which may include a Labyrinth. Other projects proposed for the site are even more comprehensive and connect many different areas of interest such as education, training, community gatherings, meetings and events. The Steering Committee Feasibility phase is drawing to a close, following many productive meetings, intensive discussions and preparation of documents. Recommendations to Council are being prepared for an FCC meeting in the coming weeks. Stay tuned for more encouraging information ... and the FCC meeting date ... soon. ​The Group again thanks you all for your continued support and interest ... invites anyone interested in the Project to contact them. Next Market is 19th June. It has been a long journey for the community working group to reach this point and we are very hopeful that a new and exciting journey is just ahead, where the community will finally be able to get involved in creating interesting and positive environmental and community projects at Down’s Estate. Our group finished Steering Committee meetings with Council Officers at the end of May. We believe that together we were able to make sufficient progress in addressing the feasibility our proposal to enable a launch of the Community Amalgamated Use project. The Council Staff participating in the meetings informed us at the conclusion of the last meeting that they would recommend in their report to Council that we can proceed to a staged implementation. We greatly appreciate the support we have received from Council Officers and from many different groups along the way, including Seaford Community Committee, Frankston Environmental Friends Network and Patterson River Secondary College. Thank you to all who attended the FCC meeting to lend your support. An excellent result of the FCC meeting on 18th July was the unanimous adoption of Option 4. The wording was changed slightly on the night – details soon - but the essence is as per the Agenda - click to view photo below. Now the opportunity is really open for YOU to get involved with your ideas. Please contact the group (or the SCC) to get involved. A great result for the community! Our group is very happy to announce to the Frankston community that on Monday night, Council unanimously approved DECWG to start work on a community use project at Down's Estate. This will begin by the formation of an Incorporated Association and we will be letting community members know in the near future how they can be a part of bringing this very special place back to life, for everyone to appreciate and enjoy. This moment has been 4 years in the making and it is wonderful to finally have Council approval. We have had good support in the last 4 months from Council Officers, local politicians and the community to achieve this outcome. We welcome new people to this start up process and will be using Facebook - https://www.facebook.com/Downs-Estate-Community-Working-Group-674110345965853/ - and other local venues to put up regular updates now we have reached this stage. Thank you again for your interest and we look forward to meeting you at the Seaford Farmers' Market community stall or contact us by leaving a message online or use our mail address. A further report on the unanimous support by FCC for the community project. Yell out if you have ideas and/or want to get involved. A COMMUNITY group working to historic farm buildings at Down’s Estate in Seaford have been given 18 months to show that a farm homestead and large shed should not be demolished. The Down’s Estate Community Working Group (DECWG) received unanimous backing from councillors at this month’s public council meeting to begin work on “a community use project”. The group hopes an indigenous bush-food garden and permaculture site can be established at Down’s Estate alongside an indigenous cultural trail. DECWG representative Maureen Griffin told councillors at the meeting that the group wants to work to save the farm homestead, formerly occupied by renowned whip and saddlemaker Harry Down, and a large shed on the site. “We want to give it our best shot to save the house for the historic value and the story it tells,” she said. A carport, outbuildings, water tank and windmill frame have been demolished due to being deemed unsafe. The community group’s members will now carry out maintenance and weeding at Down’s Estate and undertake a basic restoration of the shed if funds can be found. Weeding to control Spiny Rush on the estate is done by council using Melbourne Water grant funds so the weed does not enter the adjoining Ramsar-listed Seaford Wetlands. Council officers recommended the DECWG become an incorporated entity to be eligible for council funding considered in future budgets. Officers previously backed the demolition of the homestead and shed but Councillors decided to give the DECWG more time to prove the buildings can be saved for community use (‘Historic homestead saved’, The Times 7/3/16). At this month’s meeting council officers again favoured demolishing the buildings but Councillors backed an option to “retain the house for a further 18 months with the option to renovate it contingent on funding availability and the progress of the DECWG program”. Since July 18, we have been working to establish our Incorporated Association which is now a few weeks away and we will notify you when this is achieved. We will then negotiate a 12 month licence with Council and be starting some simple community activities on the Estate. We will let community members know as soon as possible how they can be a part of bringing this very special place back to life. We are very pleased to announce that we received a community grant from Frankston City Council which will assist with this start up. We will be one of the groups accepting a grant at the Mayor’s Picnic on September 11 (Monterey Community Park, North Frankston, 11am-3pm). We are part of the Frankston Environmental Friends Network stall and will be there during the day. * We also are part of the Seaford Farmers' Market held on the 3rd Sunday of each month on the Seaford Community Committee stall. The group is now incorporated as an Association and will be known as the Down’s Estate Community Project Inc. The second excellent piece of news is that the group was successful in obtaining $700 towards governance and setting up costs in the Frankston Council Community grants. "All of you following this story can say a big Hurray! with us. The next step is to negotiate a licence with Council." We will keep you informed here and on Facebook.